Second thread, no one come for this black little chihuahua on her first thread! COME ON FOLKS!!! MY LEG IS 'BROKEN' & 'NOBODY-CARES'? Second thread, no one shared the first!! HALO has been walking on her broken leg for a long time, please feel her pain??? Halo needs a RESCUE ASAP! She has an old fracture on front right leg, she’s been walking on leg and the skin is now raw. They are keeping her in a small space to keep from walking on, needs rescue and medical help. 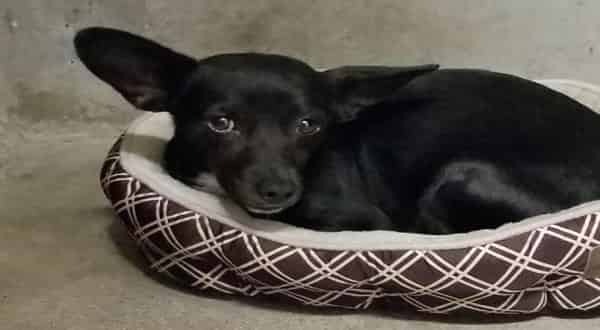 Halo is a young female Chi mix, please help share. 2 Responses to "Second thread, no one come for this black little chihuahua on her first thread!" Why aren't you doing something about his leg? If the skin is raw he obviously need medical attention! This dog has been rescued and we need donations to help fix her leg! Please go to Milton Mutts website for the link.